The new disease maps will enable turf managers to see the pattern of disease development, and be ready to take appropriate action when the risk threatens their playing surfaces. GreenCast provides independently validated forecasts of key turf diseases including Fusarium, Anthracnose, Dollar Spot and Take All. STRI trials have demonstrated that preventative Heritage fungicide applications based solely on GreenCast disease forecasts, when periods of high risk occurred, provided greater disease control and created better turf quality from fewer applications over the course of the season, compared to conventional routine applications. 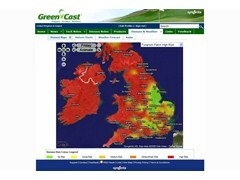 The new in the GreenCast mapping forecasts also now include a prediction of grass growth potential. Turf managers can use the information to tailor nutritional inputs more accurately to turf growth, as well as timing initial applications of Primo MAXX growth regulator more precisely to get the best results in reduced mowing costs and improved turf quality. And a further update sees a new one page five-day Weather and Disease Summary, which now gives all the key turf management information on a single one-click report - including a detailed weather forecast with severe weather warnings, predictions of impending turf disease risks, soil temperatures and a unique five-day, hour-by-hour, forecast of conditions suitable for spraying.